Fun Friday- Let Me Introduce Myself to You! --This upcoming series started out as a fun idea to highlight my kids on my blog. They are, afterall, very much an integral part of my life and who I am. I am a mom. But I am also a few more things, including wife to an amazing man so I decided to slip in a quick post about my hubby and myself first. Starting the first Friday in June, that's next week ya'll, I will introduce the four kids. Fair warning, I got to interview them and they are more interesting than my hubby and me. It's ok, it won't hurt my feelings of you agree! How did we meet? In 8th grade. Yes, really. He was new at the school and I heard everyone talking about him being "back". They knew of him from a few years earlier. Did we always date? Yes. We dated each other, then each other's friends. You remember how that used to work! Sad, but true. Are our kids allowed to date? Heavens no. ;) No casual dating allowed here. We know how painful that can be. OK, any relationships can be painful, but we want to avoid as much drama as possible. How long have we been married? Seems like forever, but it has only been 20 years. Almost 21. Where has time gone and does that make us old? Do you all really like moving THAT much? Mostly. I never saw my life with going on 13 moves in it. BUT, it has been an adventure. And a mostly good one at that! Have I mentioned we are packing up yet again- in 17 days?! Are you all as strict of parents as you seem? Probably. We love our kids dearly, expect a lot from them and then grin ear to ear when they live up to our expectations. We figure if you are hard on them in the early years, you can enjoy them in the later ones. So can everyone else. So far, our theory is working. Where do you see yourselves in 20 years? Tired. heehee Just kidding! Hopefully, snuggled in a little cabin in Colorado surrounded by our friends, kids and maybe a few grandkids even. And thanking the Lord for the life He has blessed us with! Ahhhh, high school. The years that "count". No pressure, right? Actually, I love teaching high school, though teaching is a relative term. We have found that by this point in their journey, they are pretty self sufficient. Other than grading tests, talking out some things, and maybe experiments, our high schoolers are mostly on their own. This is a time to learn to be self motivated, as college is just around the corner and mom will not always be there to check up with you! Anyway- we have had a good year, though quite busy. One Year Adventure Novel- We almost did not get this program because of the price but my daughter begged. I am glad she is persistent. After 8 months of writing she completed her first novel and is now revising it. Proud momma moment! Rosetta Stone Spanish, Levels 1 and 2- I am going to just put this out there…I am CONVINCED that the reason my daughter has done so well and moved so fast with this program is because of her previous Spanish courses. For that reason, I highly recommend you have your child take Spanish A and B from Classical Academic Press. It is a very sound program, thorough, and the video teaching helps the child hear what they should sound like. Writing Fiction with Sharon Watson- Again, God’s timing is perfect and this came when we were finishing up the Adventure novel. I was concerned nothing could follow, but this was a wonderful program that further encouraged my daughter with her writing, fine tuned it even more and spurred her on to work on the second draft of her novel. High School Genius Prep- We recently reviewed this and are still reading it. If your child is headed to college you really should own a copy of this! There is now a code for all my readers for $5.00 off this book. See the updated review! You can start using it as early as 7th grade. No Nonsense Algebra- When we reviewed this product, we liked it. Now that my daughter is getting ready to take the Algebra CLEP test, we like it even more. The lessons are short and minus any fluff and teach solid algebra! I know that many very capable homeschooling mommas out there panic when their children near the high school age. Can I just say, DON'T! With a little planning, they can be great years. This is a time to bond, learn together and grow in your relationship! We are done with school! Well, as done as one can be when you school year round. But we ARE done with the lessons for the "school year". This is our week off and then the following week we will plunge back in the with our summer schedule. Summer usually consists of math and reading, plus a few child specific subjects on a much lighter schedule. For the youngest it will be mostly reading, for the 5th grader we will add typing and the 9th grader will be studying for the biology CLEP test. We also have a few fun TOS Reviews in the works that I am very excited about. In the middle of all that we have to move, set up a house, and work on our summer bucket list! PAL (IEW’s reading program)- I am CONVINCED this is what has made my son such a strong reader! He learned quickly and loved every minute of this program. He developed a love of reading early and I could not recommend this product enough. Yes, it requires some set up time, but it is worth every minute. Phonics and Reading with McGuffey – As you have heard me say before, I did not think I would encourage iPad apps. I changed my mind. We are still using this app almost daily and I still say if you only buy one app this year for your beginner reader, BUY THIS ONE! ABeCeDarian- This program has taken us to the next level of reading. Though completely different from PAL, it appealed to my son as well and challenged him to the next level. We will continue to use it! Touch Math- This program came to us right as we were finishing up our scheduled Math. It was a great transition for us. It got challenging pretty quickly, but with the help of the software you can buy, it is still a favorite. Because we reviewed 1st grade, we will be able to continue using it in our new school year. Hands on curriculum works for us! Song School Spanish- LOVE LOVE LOVE! Catchy songs, puppets and easy games kept us having fun. Short manageable lessons for the younger grades make learning fun and not a chore. 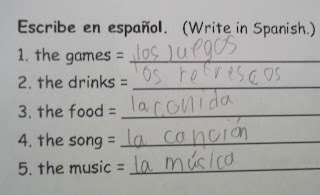 While my son was familiar with most of the vocabulary in the book (he was born in Guatemala, remember) this program allowed him to use Spanish with no reservations or fear. The songs alone are worth the price! Speekee TV- This silly little pur9ople guy won our hearts and CJ could watch those videos all day if you let him. They are finishing up production of a new set and we cannot wait. Again, a natural way for younger children to love and learn Spanish! Apologia’s Who Is God? Bible Study- We were able to review the third book in this series and loved it, so we decided to go back and start at the beginning. I would recommend using the four for 5-8th grade! Computer Science for Kids- This is one my husband and son do together, but I love watching them. It is fun to see the two guys work together and get excited about things I will never understand! Spanish for You!- We are currently using this one and it is my new favorite Spanish program for 3rd-8th grade levels. Easy to use, affordable and great audio tracks! Essentials in Writing- Honestly, writing is NOT my son’s thing. He does not enjoy it and therefore it is not fun to teach him. I was blessed by this program because by video, someone else was teaching him and took the pressure off me. I love the smaller, more manageable lessons and I love that my son got to have a male for a teacher for a change. The Pilgrim Story and Sacagawea, - Two different approaches, but GREAT History! These are at the top of my son’s list for sure! There were many other products we reviewed that we liked and once again I am reminded of how blessed I am to be a part of such an amazing group of men and women who love what they do. I am also reminded of how thankful I am to be able to homeschool my kiddos. Every minute may not always be fun, but every minute is always filled with love. See you back on Wednesday to talk about HIGH SCHOOL! This post is linked with Amy at Raising Arrows! We are also linked up at Hearts for Home blog hop! 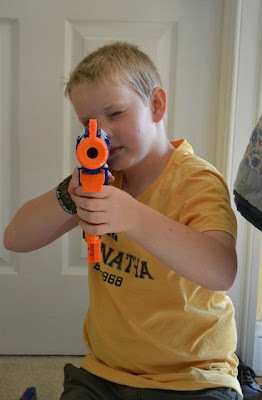 We are also linked up with The Homeschool Village Blog Hop! As most of you know, I am a reviewer for The Old Schoolhouse Magazine. That is where I find out about so many of the amazing products I share here on my blog and on my Family, Faith and Fridays facebook page. This 175 plus item resource is full of books, and even a few videos. Now, for a one time price of $25.00 you can access all that there is there now and any new resources they add. Whether you are new to homeschooling or have been doing it for years and just need a little encouragement or some new ideas, I think you will find what you need here! Who doesn't need a virtual homeschool library at your finger tips? Schoolhouse Library has all you need and more to support, encourage and cheer you on as a homeschool family. Military moms are use to it. OK, let's face it, moms in general are use to it. My oldest had her wisdom teeth taken out yesterday. "Oh, it will be easy" they said. "Teens bounce back so much easier" they said. "She'll be fine the next day" they said. NOT. SO. MUCH! Codeine is not her friend. Motrin isn't quite enough. The 5 year old developed a 101-102 temperature this morning. This is the kid who did not get sick once this whole winter. Not once! The 11 year old fell off the retaining wall in the back yard and hurt himself this afternoon. It is only because of the grace of God we did not end up in the ER. And did I mention, my husband is out of town? Of course! Well, actually by the time you read this he will be on his way home. Thankfully. I am pretty sure he is now in charge for the rest of the month. 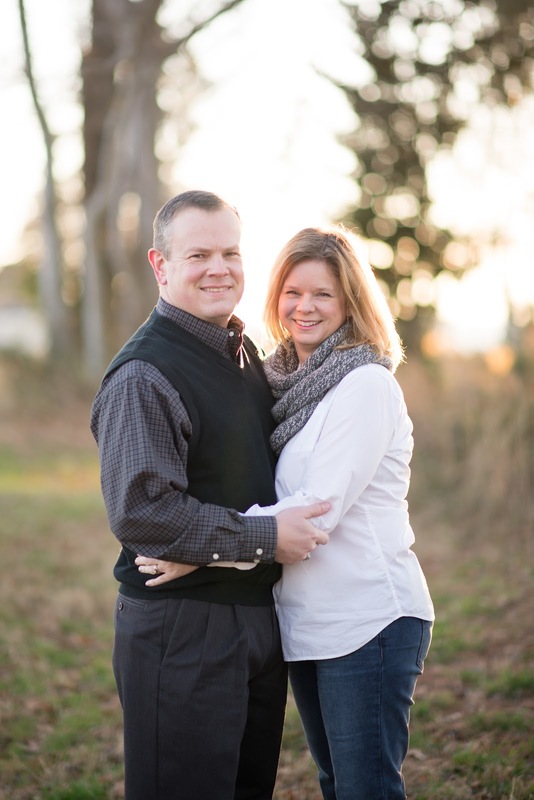 "We are an educational support company; we help people learn." (from the web site) That statement from the Joyce Herzog website peaked my interest! After all, I have four kids and they all learn very differently. I have made it my personal mission to discover those learning styles, and tailor my teaching to best suit them individually. Learning in Spite of Labels, published and written by Joyce Herzog, is a book that can help you do just that. While it does not go into huge detail about individual learning styles until the fourth section, it does provide tons of helpful tools specifically for helping any child that has a unique "label" to learn. You know those kids - those with ADD or ADHD, those with visual, speech or language delays, or those that just seem to process differently. *What Do I Need to Know? This section talks about how children learn, behavioral characteristics, and additional issues to consider - such as discipline or even where to best place your child. *What Do I Need to Do? This second section starts with 25 teaching techniques that work. My favorite is number 1- I will thank God for this situation and for this guidance and blessing. The one we use the most in this house - #10 - I will give limited choices to allow the student to have some control. It also includes a section called Teeny Tiny Teaching Tips that focuses on areas such as food, motor skills, and even pencil grip and handwriting. With the realization that your child is a person, not a problem! This final chapter talks about the laws, ADD/ADHD, speech and language development, IEP's, and Depression. One of the things I found the most interesting in this chapter was a list of famous people who overcame some pretty big obstacles in their lives. Did you know that Olympic medalist Kristi Yamaguchi had casts on her legs for the first two weeks of her life and wore corrective shoes until she was four? Or that President Woodrow Wilson did not read until he was 11? There is also a very comprehensive appendix at the end that lists a great many additional resources with contact information for parents to use. This is a simple read, really. It is broken down into manageable parts and is very user friendly. Joyce obviously speaks from her heart. She is passionate about helping kids, and it shows in every word she writes. It is from a Christian perspective. "God gives you the grace to do the job He calls you to do." (page 209) I would tell every homeschooling mom and dad out there to write that down and plaster it all over your home! More importantly, plaster it on your heart! You can download a free sample of this book if you want to get a feel for the style. Joyce is also available for phone and email consults, as well as tutoring! Fellow CREW members reviewed several other products from Joyce Herzog, including the Scaredy Cat Reading System. Click on the banner below to see those reviews! 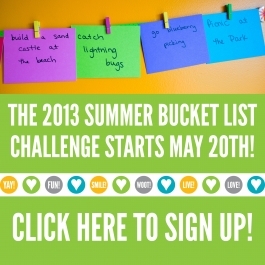 When I saw The Happy Family Movement blog issue a Summer Bucket List Challenge, I signed up immediately! I love this idea! Our family typically takes one vacation a year. We save money each month for it (read about our budgeting here) and then plan accordingly. Other than that, we don't go too many places. I am NOT a field trip kind of mom. Add a move into our summer, and well, it has the makings of a boring summer. 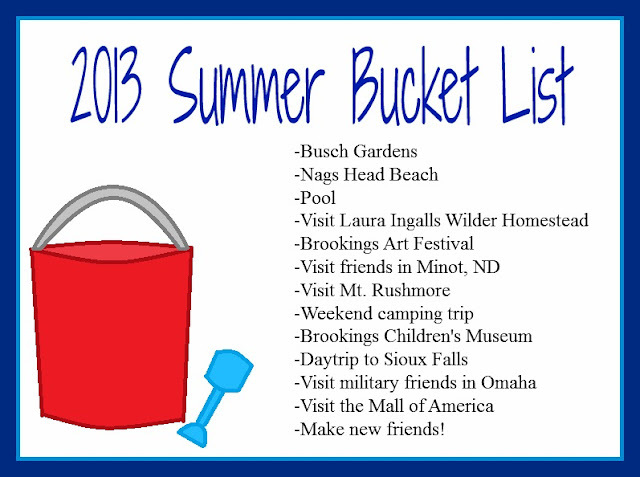 The Summer Bucket List was just what we needed to help us be deliberate in the memory making business. What about you? What do you have scheduled for your summer? This post is linked to Amy, at Raising Arrows! Yes, I have them all home...mostly! One went to the grandparents for a few days (and had a blast) one is headed to the mountains for a few days on a mission trip on the Appalacian trail hiding in her room sick now and trying to keep up with three online classes, and one seems to be living mostly in the the dance studio for practices... but technically they are ALL home. Wanna see what we have been doing? My bread maker is back! And the King of Nerf Wars! The fun never stops! And this momma's heart is happy! College Prep Genius is well known for its SAT prep course. It's been said to be able to raise a students score by 600 points. But we all know that even before a child ever gets to the point of taking the SAT there is much work to be done to prepare for college. This is not your typical how to get into college book, focusing only on the test scores and college applications. ~Foundations of Personal Success, which focuses on your student. Everything from their goals to their health and friendships are covered. ~Foundations of Academic Success- Covers chapters on how to study, get organized, and take tests. ~Foundations for Future Success- Covers choosing a college, applications, and financial considerations. There are several appendixes at the end of the book that are quite helpful, but the one I loved was a list of great books to get you started with learning. We were excited to see that we have read over half already and added more than a few to our summer reading list! My 9th grader and I used this book together. I read all of the introductory information myself. The information there includes timeline with what you should be doing at each grade level, as well as transcript templates and checklists for colleges, scholarships and even awards. The authors tell you how to set up a college notebook using these templates to help you fill in the specific tabs. Because we have already started a similar notebook, we were able to copy these forms and add to our notebook. Next, the chapter reading began. We found it easiest to have me read a chapter and then my daughter read it afterwards. Each chapter is written to the students in a conversational tone. They are very thorough, but not overloaded with too much information. This age is one that easily zones out with info overload, and we found that this did not happen with this book. After the student's reading there was a Think About It section that asked questions to get the student to think on a deeper and more personal level with the information they just read. Often these question involved "what if..." and "what would..." type questions. Then comes the parents section. This part my daughter did not read. It is addressed specifically to the parent summarizing what the student just read and gives you additional things to think about. Each of those sections is followed by parent "homework". Sometime it was just conversation starters and things to discuss with your kiddos. Other times it included additional resources to use such as websites and recommended books. After we both had read the chapter we would get together and talk about the questions she answered, any thoughts or other questions she had and then sometimes look up extra resources or add a particular item to her college notebook. I love this book! I wish I could buy all of my friends a copy! While we think that the cover and the size make it a little intimidating, the info inside is not. My daughter really enjoyed reading it and we had a lot of good discussions about it. As a mom, I am thankful to have some guidance in the college prep steps. But more importantly, I am thankful to have an author who has a heart for kids and is willing to take the time to not just dwell on the college search and scholarship money, though those are important and discussed, but also the heart issues that are prevalent during this emotional time. Similar books and programs that only discussed the technical parts of college prep have tended to overwhelm my daughter very quickly. Let's face it, this can be a complicated process and emotion driven time. More stress, we do not need! The authors have found a great balance in High School Prep Genius. You can order High School Prep Genius for $29.95 from College Prep Genius. UPDATE- Jean has kindly offered our readers a $5.00 discount for High School Prep Genius if you use the code TOSCrew at checkout. "In order to ease the burden of creating a College & Career Notebook, we created a PDF file that you can download and print from our website. We will be adding a sticker to the book cover for future parents to be able to take advantage of it. You can find the pdf at www.collegeprepgenius.com/college-career-notebook." Just finished printing these out! They are a gereat addition! Do you teach a second language at your house? Are you bilingual? If not, then you may have found that teaching a second language can be a challenge. We have found that the vocabulary part is pretty easy to pick up, but as for the mechanics and conversational part, well, that is another story. The other thing we have found is that programs for the elementary age students are either filled with fluff or are hard for the "normal" non-Spanish speaking mom to use. Until now! Enter Spanish for You!, created by Debbie Annett, a Spanish teacher of 14 years. Spanish for You! was written by Debbie and intended to teach children grades 3-8 Spanish in a simple and affordable manner. And there is NO fluff. Intended to be taught four days a week, this program covers not only vocabulary, but the mechanics of grammar as well. There are two themes available at this time, Fiestas and Estaciones, with a third theme coming soon. Each one will cover a year, 24 to 32 weeks, depending on the grade you are using. 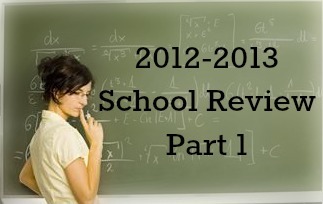 We were given the opportunity to review the complete program which has lesson plans for grades 3rd through 8th. A quick and easy download of a few files will get you started. Downloads include the lesson guides, self checking worksheets, pictures and flashcards for each lesson and two audio files. One audio is of Debbie reading each lesson, the other is that of a native speaker reading the lessons. Also included was a softbound lesson book for your child to use. Once we downloaded the material I printed off the lesson plans and bound them for easy reference. While we had access to all the grade levels, we decided to print off only the grades 5-6 for our use. Each week is broken into four days of scheduled activities. Each day listed tells you exactly what to do...from reading a specific part of the lesson to listening to part of the audio, playing a game or using the flash cards. Debbie has now divided the downloads up by grade levels so you can quickly access the files you need to listen to or the worksheets you need print out for the day. *As a side note, the files we originally received were not divided up well. With a few comments from our review crew about it being hard to find what we needed, Debbie divided up the files into grade levels. Talk about listening to input. It was only the beginning for me of being impressed with not only the program but the availability of the publisher. Debbie is a dedicated educator who obviously believes in her product, and wants to present it in the best possible way. For me, that knowledge makes the program even more special! 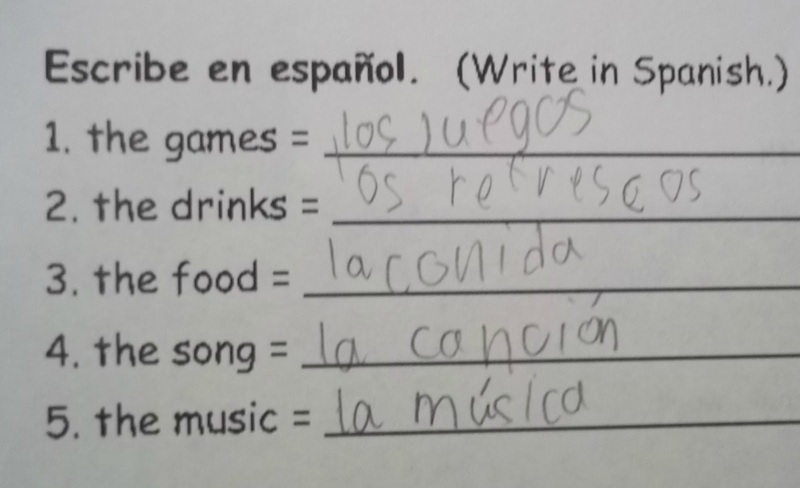 My son, a 5th grader, has been exposed to Spanish before. His younger brother was born in Guatemala so we use many Spanish words and phrases in our home. But this is the first time he has been formally introduced to the grammar part of the language. I have to say that I was impressed. He picked up on it quickly and was even able to do the worksheets without help from me. One of the things that I think really helped his retention were the audio files. I think that not only for the auditory leaner, but also for anyone, hearing the lessons after reading them helps solidify things in their minds. We especially liked hearing the tracks with the native speaker. We have learned in the past that just by hearing a native speaker say things helps you be less intimidated by the language. It becomes more natural to your ear and, of course, ensures you are pronouncing things properly. I also like that the lessons are broken into manageable sizes. We followed Debbie's four day schedule presented in the lesson plans. Information is presented slowly and then repeated often with practice in the form of suggested games, worksheets and flashcards. It is easy to follow and laid out in an organized manner. Often Debbie starts a lesson with flashcard practice, but even when she did not, we found it to be a good way to start our lesson. Let's just say that the fifth grader learns faster than the teacher sometimes! Each chapter is meant to be done in order as the learning spirals on itself, but individual books can be done in any order. Working with more than one grade of child? Not a problem. Because the complete set has lessons for all three levels (3rd&4th grade, 5th&6th, and 7th&8th) you can teach multiple levels at one time, having each child do the corresponding worksheets. Bonus- We were able to include my 5year old in many of the lessons! While he is still too young to do the worksheets, he picked up the vocabulary quickly and is always ready to play a Spanish game. He may not have understood all the conjugating of verbs, but he was able to at least know how to say something in first person. I cannot wait to start him with this program on his own in 3rd grade and will continue to use it with my 5th grader until we are finished. Then on to Estaciones! You can see a sample of the Fiestas curriculum as well to help you get a feel for how the material is presented. The first 14 pages of the book are "extras", including common phrases and commands, the alphabet, colors and numbers as well as information on making and using flash cards and games and other activities to use to enhance learning. There is also an information section about each of the 5 celebrations studied. To order Fiestas or any other products visit the Spanish for You! website. The grades 3-8 package costs $64.95 and includes the soft cover book (or e-book), lesson plans, worksheets, audio file of the entire book, as well as the audio file by a native speaker and flashcard/activity pictures (pdf file). Extra workbooks can be ordered for $12.95. You can also order separate grade levels. Also on the Spanish for You! website you will find free mini lessons and worksheets to print off. Go take a look and see what you think. You will not be disappointed! 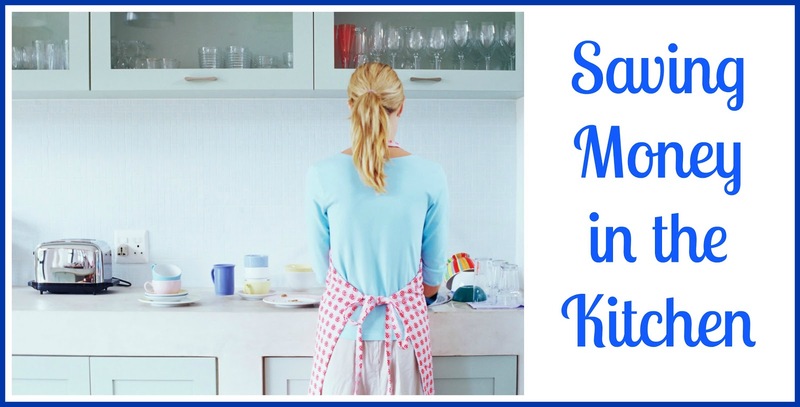 Fun Friday- Saving Money in the Kitchen Finale and Giveaway! Dinner time! What's on your menu? Fast food, you say? Honestly, we do not usually eat out just for the fun of it. Usually the service isn't that great, the food is just OK, and for a family of six it is just plain expensive. Nope, we usually are only tempted to eat out when mom does not know what is for dinner. It is irritating, it is unhealthy and it is costly. But I struggle with menu planning. Can anyone relate? The planning part is not so bad really but the coming up with things to actually put on the plan, well, that is another story. I waffle between feeling like I am boring my family to death to trying out long, fancy recipes that take a lot of time and they all turn their nose up in the end anyway. So. Done. With. That! I have a new solution! You are going to love it! I have just finished up my second round of cooking what someone else tells me to cook for a 13 week stretch. I love it. I just open the book and follow someone else's plans and recipes. Easy! My worn, well loved copy! I have mentioned Rachel Master's cookbook, Supper's on the Table, Come Home before. In this 253 page, spiral bound gem, Rachel gives you 13 weeks of 5 meals each with sides along with their recipes. To sweeten the deal she also adds a complete shopping list for each week- staples included! AND to make it even better, a special dessert and one snack idea are included for each week with all the recipes AND ingredients list. What else could you need? It was written by a mom with kids for a mom with kids. 'Ya know what I mean? None of that creame de 'la something, or fancy-smanshy, I cannot pronounce nor will my family ever eat recipes. Just real life stuff, with real life ingredients. These are good solid meal plans- a main dish, a veggie recommendation and often a bread of some sort or a fruit. Did I already mention kid friendly? I admit to having 3 out of 4 picky eaters. I do not know how it happened, but yes, my kids are somewhat picky and opinionated about food. Out of the 80 meals listed I only replaced about 5. And they were pretty easy fixes. Where split pea soup was listed, for example, I just changed it to pork loin. (sorry Rachel) I simply marked out the ingredients for that meal on the shopping list and added my own. Now when I shop, I copy the week's ingredients list, mark out all the things I already have on hand and go get the rest of what Rachel tells me I will need. Well, actually it can! Because at the end of the book are bonus recipes for everything from homemade mixes (we use the biscuit mix recipe all of the time) to holiday meal ideas and a even section on food allergies. Actually, I did reinvent the wheel a little. I admit the organizational side of me loves this concept, so I got out a notebook and the recipes I have that my family loves and made my own 13 week schedule, complete with shopping lists. It is not nearly as well done as Rachel's, but it will do. Now I do not have to menu plan for 26 weeks. Yea me! This cookbook makes a great gift for young people just starting out with cooking. Because most recipes are not too labor intensive, it is an opportunity to learn how to ease into cooking. Rachel gives start times for each portion of the meal, helping to get it all on the table at the same time. Want one? You can order a copy of Rachel's book, Supper's on the Table, Come Home from her website ~ for $15.00. Rachel is going to bless one of my readers with their own copy for free! Enter the rafflecopter below to win. I know you will love it. Thank you Rachel! Looking for ways to save money? Menu planning can be a great tool to keep you out of the grocery store too often, and keep you from those impulse items that end up costing us way too much. Give it a try and see if it doesn't help! This post is being linked up with Amy, At Raising Arrows! This post in being link to Caroline at The Modest Mom! Disclaimer- Opinions expressed are my own and were not influenced in any way by the publisher. I did not receive compensation in any form for this review. The cookbook offered is from the generous offer of Rachel!